At the Fierce launch party I noticed a banner by the entrance. It was about 5ft high and covered in the logos of all the agencies, sponsors and other organsations who had funded the festival. It stood as a testament to the work Fierce had done in making the festival possible but it was also mildly ludicrous. What was the purpose of this banner? Did anyone actually look at it in detail and take it in? Whatever, the launch was a lot of fun and festival was a big success so I guess it didn’t matter. A little over a third of the notice is devoted to logos, most of which are illegible from the street and hardly any of which are of interest to the general punter. Hewlett Packard I get since they’re in the photo printing business and local establishment like the MAC have some recognition, but most of them are insider brands. And, frankly, it looks pretty naff, not to mention ugly. There’s no denying the involvement of government agencies and private industry is essential to arts provision in this age but when did this obsession with cramming all the brands in one aesthetic car crash become the acceptable norm? What train of thought leads a sponsor to say, yes, you can have a substantial amount of money but we insist you spoil your publicity by including our cryptic logo? And has anyone done any research into what effect all this has on the general public’s perception of the event? I suspect it might be a little negative, tainting the work with the notion that it’s taking money from sick children or something. I know when I see the “Arts Council Supported” logo I have to fight back prejudices even though I completely understand the importance of getting that funding. Since this is the creative sector we’re talking about can’t we be a little more creative with how sponsorship is declared? I’d welcome comments on this. I really worry about arts funding, I worry that it distorts the art through patronage – the artrists bending thier original concept to fit the funding criteria of different organisations. The ‘insider brands’ (good choice of words btw) frighten me and make me worry about the ‘cartel’ aspect of a lot of arts funding – and you’re right serve no purpose to those outside the establishment. It’s advertsing in a way, and great advertising can be art – but logos aren’t great advertising. An excellent example of sponsorship damaging the message. The logos should be relegated to the website, but that won’t happen as long we have PR people wagging the design/communication dog. To be completely honest, I’d doubt the value of the design even if the sponsor logos were removed. The picture is wrong for the banner location, and I’d argue that a wordcentric solution would communicate better. Project X Presents is currently in the throes of its first attempt at a funded incarnation, so I read this and the comments with interest. I look forward to trying to balance the requirements of sponsors and funders (without who’s help there would probably be no project at all)) with the dedication to the purity of creativity expression which caused the project to exist in the first place. I wrote about this last year in an article for Ten4 magazine. I always push for not including logos in excessive numbers in print work. On the web it’s easy to have a “Sponsors” page, or to be creative and have each sponsor taking ownership of a particular section of a site, with associated _content_. When you get to the level of an international event like Rhubarb you attract more and more sponsors, collaborators, funders and supporters. When one of the funding providers gets to have their logo on something, then the argument is obvious. “If X gets their logo included in x,y and z then we have to include everyone”. 1. Say no to excessive logo inclusion. 2. Use the Web for sponsorship information. 3. Find more interesting (and embedded) ways for brands to gain exposure. 4. Don’t promise “your logo included in all of our print” as part of the sponsorship deal. 5. Attach sponsorship to specific elements – eg. The opening party sponsored by X, the champagne, sponsored by Y, the keynote address sponsored by Z, etc. I can’t resist responding to this as I run a project whose logo is on that banner. Digital Central has contributed a small amount of funds to this year’s festival. Firstly, I agree with your comments about the design of the banner. As a funder we do request that our support is publicly acknowledged but we don’t really specify that it has to be on everything. I have an auditor to keep happy once a year and they want to see what our money has been spent on. So showing them something with our logo on is useful but I can’t fit this banner in my evidence folder so having the logo on a leaflet or a print-out of the website would do for us. I think I’ll add that text to the ‘Logos and Branding’ guidelines on our website (just have in fact!). As long as I can keep the auditor happy then I’m happy basically. One final point though. There may be a political reason to show this many logos. It may influence those wavering about funding this event in future years to be convinced that it is something that lots of key people are buying into so they should to. What might make more sense is splitting events etc into smaller, more specific sponsorship domains. “The Razzle Dazzle Cocktail Bar, sponsored by Martini”, “The New Bands Stage, sponsored by 4Talent”, “The Festival Newsletter, sponsored by Rymans”, at least where possible. This would be win-win, aesthetically and also in terms of the public actually coming to positively associate a brand with something that actually has something to do with the brand’s function. Of course, the convoluted nature of much arts funding (insider brands etc) makes this impossible in some cases, but where possible, it should be the default, rather than the muddy “if we throw our logo at people enough, eventually it’ll stick” approach. Far from the sponsors being annoyed that their logo is used less, I’d have thought they’d be pleased to see it used in an appropriate targeted way that associates them and them alone with a facet of an event linked to their business. Interesting, they wouldn’t believe your accounts and other documentation? Do the auditors care about building these funding ‘brands’ in the same way that, say, Becks use arts funding? It just seems a waste of energy for all concerned, when they could be getting on with – what they want to do – helping artists. The auditor just cares about linking the costs incurred to an activity on the project. So seeing a logo in situ is confirmation, along with accounts etc., that the money was spent on what you said it was spent on. I was making the point that the auditor doesn’t care about seeing it on a big banner so as funders we shouldn’t ask to see it on a big banner and having it tucked away on a leaflet or a website page is enough. Logo-itis is a symptom of something more infuriating: the overwhelming amount of bureacracy that has gone into sharing out often modest amounts of money. 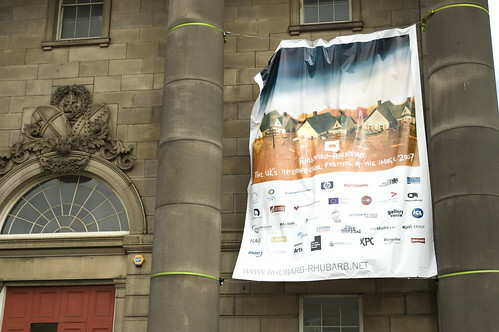 I count 37 funders/sponsors on that banner. How much money has been diverted from the arts into public servants administrating these 30 odd relationships relationships? I understood that, I suppose I really mean “why are there logos?”, in the sense that the whole branding exercise seems very insular.